What is a Start Form? Your pipe’s start form is the form you and all members of the pipe will see when you click the 'Create new card'-button. It represents a process’ input. Each pipe has its own start form, with its own fields and instructions. The fields in your start form represent all the necessary information people will be required to fill in order to create a new card. A start form can be accessed by all the members allowed to create cards on your pipe. 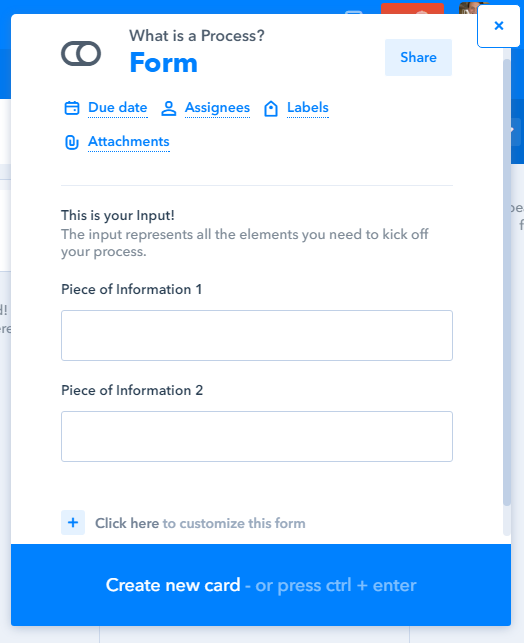 You can also choose to make your start form public, so that it’ll be accessible via a URL or embedded on your site (it will then be called a public form). How to create a Start Form?